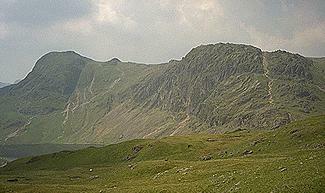 The view of Harrison Stickle and Pavey Ark improves as one treads the path from Blea Rigg towards Sergeant Man. The North Rake, leading to the summit of Pavey is very clear here. There is a glimpse of Stickle Tarn low on the left. Larger version of this picture.